This concrete transport truck is built to mix cement with an aggregate (such as sand or gravel) and water, to produce concrete. Cement, in the most general sense of the word, is a binder, a substance that sets and hardens independently, and can bind other materials together. The name "cement" goes back to the Romans, who used the term "opus caementitium" to describe masonry which resembled concrete and was made from crushed rock with burnt lime as binder. The volcanic ash and pulverized brick additives which were added to the burnt lime to obtain a hydraulic binder were later referred to as cementum, cimentum, cäment, and cement. Cements used in construction are characterized as hydraulic or non-hydraulic. The most important use of cement is the production of mortar and concrete—the bonding of natural or artificial aggregates to form a strong building material that is durable in the face of normal environmental effects. Hydraulic cements are materials which set and harden after combining with water, as a result of chemical reactions with the mixing water and, after hardening, retain strength and stability even under water. The key requirement for this is that the hydrates formed on immediate reaction with water are essentially insoluble in water. Most construction cements today are hydraulic, and most of these are based upon Portland cement, which is made primarily from limestone, certain clay minerals, and gypsum, in a high temperature process that drives off carbon dioxide and chemically combines the primary ingredients into new compounds. Non-hydraulic cements include such materials as (non-hydraulic) lime and gypsum plasters, which must be kept dry in order to gain strength, and oxychloride cements, which have liquid components. Lime mortars, for example, "set" only by drying out, and gain strength only very slowly by absorption of carbon dioxide from the atmosphere to re-form calcium carbonate through carbonatation. Setting and hardening of hydraulic cements is caused by the formation of water-containing compounds, forming as a result of reactions between cement components and water. The reaction and the reaction products are referred to as hydration and hydrates or hydrate phases, respectively. As a result of the immediately starting reactions, a stiffening can be observed which is very small in the beginning, but which increases with time. After reaching a certain level, this point in time is referred to as the start of setting. The consecutive further consolidation is called setting, after which the phase of hardening begins. The compressive strength of the material then grows steadily, over a period which ranges from a few days in the case of "ultra-rapid-hardening" cements, to several years in the case of ordinary cements. The earliest construction cements are as old as construction, and were non-hydraulic. Wherever primitive mud bricks were used, they were bedded together with a thin layer of clay slurry. Mud-based materials were also used for rendering on the walls of timber or wattle and daub structures. Lime was probably used for the first time as an additive in these renders, and for stabilizing mud floors. A "daub" consisting of mud, cow dung, and lime produces a tough and water-proof coating, due to coagulation, by the lime, of proteins in the cow dung. This simple system was common in Europe until quite recent times. With the advent of fired bricks, and their use in larger structures, various cultures started to experiment with higher-strength mortars based on bitumen (in Mesopotamia), gypsum (in Egypt) and lime (in many parts of the world). It is uncertain where it was first discovered that a combination of hydrated non-hydraulic lime and a pozzolan produces a hydraulic mixture, but concrete made from such mixtures was first used on a large scale by the Romans. They used both natural pozzolans (trass or pumice) and artificial pozzolans (ground brick or pottery) in these concretes. Many excellent examples of structures made from these concretes are still standing, notably the huge monolithic dome of the Pantheon in Rome. The use of structural concrete disappeared in medieval Europe, although weak pozzolanic concretes continued to be used as a core fill in stone walls and columns. In Britain particularly, good quality building stone became ever more expensive during a period of rapid growth, and it became a common practice to construct prestige buildings from the new industrial bricks, and to finish them with a stucco to imitate stone. Hydraulic limes were favored for this, but the need for a fast set time encouraged the development of new cements. Most famous among these was Parker's "Roman cement" This was developed by James Parker in the 1780s, and finally patented in 1796. It was, in fact, nothing like any material used by the Romans, but was a "Natural cement" made by burning septaria—nodules that are found in certain clay deposits, and that contain both clay minerals and calcium carbonate. The burnt nodules were ground to a fine powder. This product, made into a mortar with sand, sets in 5-15 minutes. The success of "Roman Cement" led other manufacturers to develop rival products by burning artificial mixtures of clay and chalk. John Smeaton made an important contribution to the development of cements when he was planning the construction of the third Eddystone Lighthouse (1755-9) in the English Channel. He needed a hydraulic mortar that would set and develop some strength in the twelve hour period between successive high tides. He performed an exhaustive market research on the available hydraulic limes, visiting their production sites, and noted that the "hydraulicity" of the lime was directly related to the clay content of the limestone from which it was made. Smeaton was a civil engineer by profession, and took the idea no further. Apparently unaware of Smeaton's work, the same principle was identified by Louis Vicat in the first decade of the nineteenth century. Vicat went on to devise a method of combining chalk and clay into an intimate mixture, and, burning this, produced an "artificial cement" in 1817. James Frost, working in Britain, produced what he called "British cement" in a similar manner around the same time, but did not obtain a patent until 1822. In 1824, Joseph Aspdin patented a similar material, which he called Portland cement, because the render made from it was in color similar to the prestigious Portland stone. All the above products could not compete with lime/pozzolan concretes because of fast-setting (giving insufficient time for placement) and low early strengths (requiring a delay of many weeks before formwork could be removed). Hydraulic limes, "natural" cements and "artificial" cements all rely upon their belite content for strength development. Belite develops strength slowly. Because they were burned at temperatures below 1250 °C, they contained no alite, which is responsible for early strength in modern cements. The first cement to consistently contain alite was that made by Joseph Aspdin's son William in the early 1840s. This was what we call today "modern" Portland cement. Because of the air of mystery with which William Aspdin surrounded his product, others (for example, Vicat and I.C. Johnson) have claimed precedence in this invention, but recent analysis of both his concrete and raw cement have shown that William Aspdin's product made at Northfleet, Kent was a true alite-based cement. However, Aspdin's methods were "rule-of-thumb:" Vicat is responsible for establishing the chemical basis of these cements, and Johnson established the importance of sintering the mix in the kiln. William Aspdin's innovation was counter-intuitive for manufacturers of "artificial cements," because they required more lime in the mix (a problem for his father), because they required a much higher kiln temperature (and, therefore, more fuel) and because the resulting clinker was very hard and rapidly wore down the millstones, which were the only available grinding technology of the time. Manufacturing costs were therefore considerably higher, but the product set reasonably slowly and developed strength quickly, thus opening up a market for use in concrete. The use of concrete in construction grew rapidly from 1850 onwards, and was soon the dominant use for cements. Thus, Portland cement began its predominant role. Cement is made by heating limestone with small quantities of other materials (such as clay) to 1450 °C in a kiln. The resulting hard substance, called "clinker," is then ground with a small amount of gypsum into a powder to make "Ordinary Portland Cement," the most commonly used type of cement (often referred to as OPC). Portland cement is a basic ingredient of concrete, mortar, and most non-specialty grout. The most common use for Portland cement is in the production of concrete. Concrete is a composite material consisting of aggregate (gravel and sand), cement, and water. As a construction material, concrete can be cast in almost any shape desired, and once hardened, can become a structural (load bearing) element. Portland cement may be gray or white. These are often available as inter-ground mixtures from cement manufacturers, but similar formulations are often also mixed from the ground components at the concrete mixing plant. Portland Blastfurnace Cement contains up to 70 percent ground granulated blast furnace slag, with the rest Portland clinker and a little gypsum. All compositions produce high ultimate strength, but as slag content is increased, early strength is reduced, while sulfate resistance increases and heat evolution diminishes. Used as an economic alternative to Portland sulfate-resisting and low-heat cements. Portland Flyash Cement contains up to 30 percent fly ash. The fly ash is pozzolanic, so that ultimate strength is maintained. Because flyash addition allows a lower concrete water content, early strength can also be maintained. Where good quality cheap fly ash is available, this can be an economic alternative to ordinary Portland cement. Portland Pozzolan Cement includes fly ash cement, since fly ash is a pozzolan, but also includes cements made from other natural or artificial pozzolans. In countries where volcanic ashes are available (for example, Italy, Chile, Mexico, the Philippines) these cements are often the most common form in use. Portland Silica Fume cement. Addition of silica fume can yield exceptionally high strengths, and cements containing 5-20 percent silica fume are occasionally produced. However, silica fume is more usually added to Portland cement at the concrete mixer. Masonry Cements are used for preparing bricklaying mortars and stuccos, and must not be used in concrete. They are usually complex proprietary formulations containing Portland clinker and a number of other ingredients that may include limestone, hydrated lime, air entrainers, retarders, waterproofers, and coloring agents. They are formulated to yield workable mortars that allow rapid and consistent masonry work. Subtle variations of Masonry cement in the U.S. are Plastic Cements and Stucco Cements. These are designed to produce controlled bond with masonry blocks. Expansive Cements contain, in addition to Portland clinker, expansive clinkers (usually sulfoaluminate clinkers), and are designed to offset the effects of drying shrinkage that is normally encountered with hydraulic cements. This allows large floor slabs (up to 60 m square) to be prepared without contraction joints. White blended cements may be made using white clinker and white supplementary materials such as high-purity metakaolin. Colored cements are used for decorative purposes. In some standards, the addition of pigments to produce "colored Portland cement" is allowed. In other standards (for example, ASTM), pigments are not allowed constituents of Portland cement, and colored cements are sold as "blended hydraulic cements." Pozzolan-lime cements. Mixtures of ground pozzolan and lime are the cements used by the Romans, and are to be found in Roman structures still standing (for example the Pantheon in Rome). They develop strength slowly, but their ultimate strength can be very high. The hydration products that produce strength are essentially the same as those produced by Portland cement. Slag-lime cements. Ground granulated blast furnace slag is not hydraulic on its own, but is “activated” by addition of alkalis, most economically using lime. They are similar to pozzolan lime cements in their properties. Only granulated slag (that is, water-quenched, glassy slag) is effective as a cement component. Supersulfated cements. These contain about 80 percent ground granulated blast furnace slag, 15 percent gypsum or anhydrite and a little Portland clinker or lime as an activator. They produce strength by formation of ettringite, with strength growth similar to a slow Portland cement. They exhibit good resistance to aggressive agents, including sulfate. Calcium aluminate cements are hydraulic cements made primarily from limestone and bauxite. The active ingredients are monocalcium aluminate CaAl2O4 (CA in Cement chemist notation) and Mayenite Ca12Al14O33 (C12A7 in CCN). Strength forms by hydration to calcium aluminate hydrates. They are well-adapted for use in refractory (high-temperature resistant) concretes, for example, for furnace linings. Calcium sulfoaluminate cements are made from clinkers that include ye’elimite (Ca4(AlO2)6SO4 or C4A3 in Cement chemist’s notation) as a primary phase. They are used in expansive cements, in ultra-high early strength cements, and in "low-energy" cements. Hydration produces ettringite, and specialized physical properties (such as expansion or rapid reaction) are obtained by adjustment of the availability of calcium and sulfate ions. Their use as a low-energy alternative to Portland cement has been pioneered in China, where several million metric tons per year are produced Energy requirements are lower because of the lower kiln temperatures required for reaction, and the lower amount of limestone (which must be endothermically decarbonated) in the mix. In addition, the lower limestone content and lower fuel consumption leads to a CO2 emission around half that associated with Portland clinker. However, SO2 emissions are usually significantly higher. “Natural” Cements correspond to certain cements of the pre-Portland era, produced by burning argillaceous limestones at moderate temperatures. The level of clay components in the limestone (around 30-35 percent) is such that large amounts of belite (the low-early strength, high-late strength mineral in Portland cement) are formed without the formation of excessive amounts free lime. As with any natural material, such cements have very variable properties. Geopolymer cements are made from mixtures of water-soluble alkali metal silicates and aluminosilicate mineral powders such as fly ash and metakaolin. Cement manufacture causes environmental impacts at all stages of the process. These include emissions of airborne pollution in the form of dust, gases, noise, and vibration when operating machinery and during blasting in quarries, and damage to countryside from quarrying. Equipment to reduce dust emissions during quarrying and manufacture of cement is widely used, and equipment to trap and separate exhaust gases are coming into increased use. Environmental protection also includes the re-integration of quarries into the countryside after they have been closed down by returning them to nature or re-cultivating them. Cement manufacture contributes greenhouse gases both directly through the production of carbon dioxide when calcium carbonate is heated, producing lime and carbon dioxide, and also indirectly through the use of energy, particularly if the energy is sourced from fossil fuels. The cement industry produces 5 percent of global human-made CO2 emissions, of which 50 percent is from the chemical process, and 40 percent from burning fuel. A cement plant consumes 3,000 to 6,500 MJ of fuel per metric ton of clinker produced, depending on the raw materials and the process used. Most cement kilns today use coal and petroleum coke as primary fuels, and to a lesser extent natural gas and fuel oil. Selected waste and by-products with recoverable calorific value can be used as fuels in a cement kiln, replacing a portion of conventional fossil fuels, like coal, if they meet strict specifications. Selected waste and by-products containing useful minerals such as calcium, silica, alumina, and iron can be used as raw materials in the kiln, replacing raw materials such as clay, shale, and limestone. Because some materials have both useful mineral content and recoverable calorific value, the distinction between alternative fuels and raw materials is not always clear. For example, sewage sludge has a low but significant calorific value, and burns to give ash containing minerals useful in the clinker matrix. Producing cement has significant positive and negative impacts at a local level. On the positive side, the cement industry may create employment and business opportunities for local people, particularly in remote locations in developing countries where there are few other opportunities for economic development. Negative impacts include disturbance to the landscape, dust and noise, and disruption to local biodiversity from quarrying limestone (the raw material for cement). In 2002, the world production of hydraulic cement was 1,800 million metric tons. The top three producers were China with 704, India with 100, and the United States with 91 million metric tons for a combined total of about half the world total by the world's three most populous states. For the past 18 years, China consistently has produced more cement than any other country in the world. […] China's cement export peaked in 1994 with 11 million tons shipped out and has been in steady decline ever since. Only 5.18 million tons were exported out of China in 2002. Offered at $34 a ton, Chinese cement is pricing itself out of the market as Thailand is asking as little as $20 for the same quality. Demand for cement in China is expected to advance 5.4 percent annually and exceed 1 billion metric tons in 2008, driven by slowing but healthy growth in construction expenditures. Cement consumed in China will amount to 44 percent of global demand, and China will remain the world's largest national consumer of cement by a large margin. 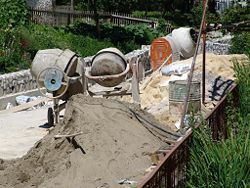 In 2006, it was estimated that China manufactured 1.235 billion metric tons of cement, which is 44 percent of the world total cement production. ↑ P.C. Hewlett (ed. ), Lea's Chemistry of Cement and Concrete, 4th edition (London: Arnold, 1998, ISBN 0340565896). ↑ A.J. Francis, The Cement Industry 1796-1914: A History (Newton Abbot, UK: David & Charles, 1977, ISBN 0-7153-7386-2). ↑ Francis (1977), Ch 5. ↑ Hewlett (1998), Ch 1. ↑ S.H Kosmatka and W.C. Panarese, Design and Control of Concrete Mixtures (Skokie, IL: Portland Cement Association, 1998, ISBN 0-89312-087-1). ↑ U.S. Federal Highway Administration, Ground Granulated Blast-Furnace Slag. Retrieved June 24, 2008. ↑ U.S. Federal Highway Administration, Fly Ash. Retrieved June 24, 2008. ↑ U.S. Federal Highway Administration, Silica Fume. Retrieved June 24, 2008. ↑ G.C. Bye, Portland Cement, 2nd edition (London: Thomas Telford, 1997, ISBN 0727727664). ↑ Energy Information Administration, Emissions of Greenhouse Gases Report. Retrieved June 25, 2008. ↑ World Business Council for Sustainable Development, The Cement Sustainability Initiative: Progress report. Retrieved June 24, 2008. ↑ World Business Council for Sustainable Development, Guidelines for the Selection and Use of Fuels and Raw Materials in the Cement Manufacturing Process. Retrieved June 24, 2008. ↑ Yan, Li Yong 2004. China's way forward paved in cement. Asia Times. Retrieved June 24, 2008. ↑ Cement Americas, China's cement demand to top 1 billion tons in 2008. Retrieved June 24, 2008. Bhatty, Javed I., F. MacGregor Miller, and Steven H. Kosmatka. 2004. Innovations in Portland Cement Manufacturing. Skokie, IL: Portland Cement Association. ISBN 9780893122348. Bye, G.C. 1999. Portland Cement, 2nd edition. London: Thomas Telford. ISBN 0727727664. Hewlett, P.C. ed. 1998. Lea's Chemistry of Cement and Concrete, 4th edition. London: Arnold. ISBN 0340565896. Locher, Friedrich Wilhelm. 2006. Cement Principles of Production and Use. Dusseldorf, DE: Verlag Bau + Technik GmbH. International cement industry Sustainability Initiative. Example of Sustainable Cement initiatives from suppliers (UK). This page was last modified on 20 January 2017, at 21:32.